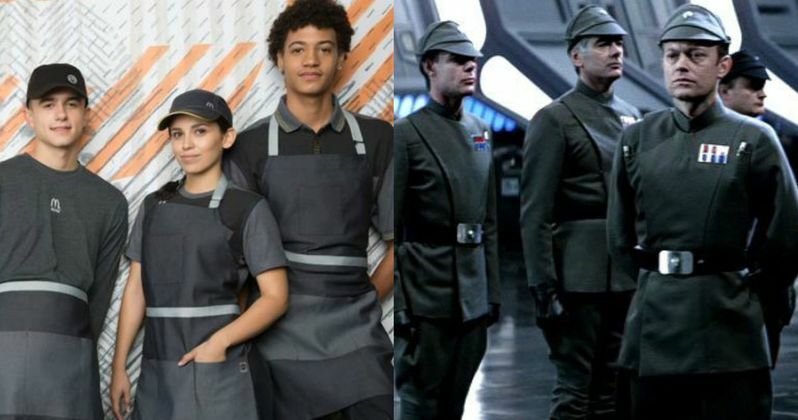 While you might not be able to lock down a good job with the Imperial Senate, you can start working for McDonald's, where your uniform will make you feel like part of the Empire's massive fleet. This year, McDonald's has decided to give their floor crew a makeover. And the new uniforms are being slammed. As they truly make the wait staff and cook team look like Darth Vader's minions. Some are even comparing them to the dystopian society seen in The Hunger Games. Fast food chain McDonald's launched their new uniforms in the U.S. earlier this month. And this time out, they decided to go with a modern ensemble that was functional yet fashionable. You can decide for yourself if they succeeded or failed, with some of the better tweets included below courtesy of CNBC. But most social media pundits are calling foul on this new look, as they make the employees look like villains from a Star Wars movie. The new uniforms have arrived in Imperial grey, quite literally. Some have even compared these clothes to those worn in the Mel Brooks spoof Space Balls. McDonald's stated purpose was to bridge the 'gap between fashion and function, allowing for an easy transition from the restaurant to a social environment.' At least, that's the statement they released on the Internet. Waraire Boswell and Bindu Rivas designed the new uniforms, which launched at 14,000 restaurants across the country starting April 12. McDonald's stated. "This major move is another step in the company's commitment to become America's best first job and improve the restaurant experience." McDonald's claims that 70% of its staff declared the uniform 'very modern' and said they were 'proud to wear' these clothes. McDonald's also posted a new video that takes costumers through the years in terms of its costume changes, starting in the 1950s with an all-white uniform, to a brown and white checkerboard style dress for female employees in 1968, that required them to wear a bow in their hair, and the white and blue uniforms of the 70s. This new 2017 style comes with a dark apron for tying around the neck or waist. And it comes with a very Empire appropriate hat. McDonald's senior director of HR Jez Langhorn said this in a statement. "Our new collections focus on comfort, fit, functionality and contemporary professionalism, delivering a uniform that crew and managers will feel comfortable to work in and proud to wear. Beyond that, it's another step in the company's continuous effort to raise the bar by investing in people and improving the restaurant experience with a focus on hospitality." You can take a look at the uniforms here and decide for yourself. Does this look like a fast food team on planet earth? Or is this the gang responsible for flipping President Snow and Governor Tarkin's burgers?